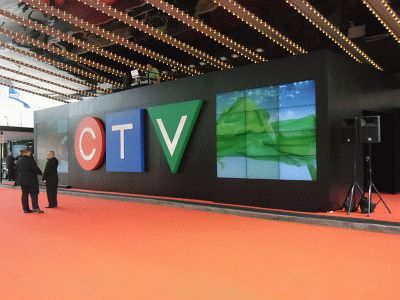 Industry Update – Bell Media/CTV 2012 Upfronts | TV, eh? This is the first year I attend CTV/Bell Media’s upfronts. Press conferences are held at Bell Media Queen Street. The upfront presentation is held at The Sony Centre for the Performing Arts, for the second straight year. The fall 2012 slate for both CTV and CTV Two is about what one expects from the channel. Aside from Flashpoint, American shows are the order of the day. CTV Two airs Saturday reruns – it doesn’t use the term “encore presentations,” which is to its credit. CTV Two’s Saturday schedule features The Listener, The LA Complex, Saving Hope, and The Borgias. Midseason introduces a show called Motive (working title), a crime procedural. Catherine MacLeod is the Vice-President, Specialty Channels at Bell Media. The most interesting thing she says to me is that The LA Complex will undergo a “retool” for its second season, possibly including a castmember shuffle. MacLeod is aware of the show’s poor performance, yet reasons that its poor showing on The CW is the result of everything doing poorly on The CW, and young people not watching as much television. MacLeod notes The LA Complex‘s positive critical reception. As for Todd and the Book of Pure Evil and Picnicface‘s cancellations, MacLeod gives me a flat “they just weren’t performing.” The Borealis pilot is completed, but not yet scheduled. Four of the shows on The Comedy Network’s 2011-12 development slate – Hotz D.V.M., Spun Out, The Tim Steeves Project and Satisfaction – are still in development. No new channels, or rebrands of existing channels, are on the horizon for Bell Media. The six press conferences take three hours total. For the most part, they’re breezy – light on detail, aside from the Flashpoint conference. Of note, Flashpoint will have a two-hour finale. CTV has no reason to screw with Flashpoint – it’s the rare case of a Canadian show ending on its own terms. At seventy-five episodes, it will live on in reruns for years to come. The afternoon presentation formally announces Astral’s introduction into the Bell Media family, barring “little things” like CRTC regulations. That’s actually how Bell Media President Kevin Crull sells a $3.38 billion acquisition to advertisers. The upfront presentation is strangely formatted. Stars enter, stand for five seconds, and leave. CTV Programming & Sports President Phil King says he won’t run down the schedule, then does so later in the presentation. I don’t understand why he teases the advertisers, and other attendees, like that. Odd things in the base schedules stand out for me, like SportsCentre airing on CTV three times a week, on weekend afternoons. CTV allows Juicebox a two-hour, early-Saturday-morning block, while CTV Two gives Juicebox two hours of time early on Sundays. TSN’s documentary series, Engraved on a Nation: Stories of the Grey Cup, the CFL and Canada, follows CTV’s 4:00 PM ET Sunday edition of SportsCentre. For the 2012-13 season, CTV still gives The Littlest Hobo ninety minutes of weekend, early-morning time. I’m surprised that dog isn’t the mascot for CTV’s 2012 London Olympics coverage. Overall, I’m disappointed by Bell Media’s upfront. Upfronts should be a time to introduce new acquisitions and launches, but Bell Media is more interested this year in which companies it buys, instead of which shows it develops. Maybe the not-yet-completed Astral deal prevents Bell Media from showing its full hand, as Bell Media assumes Astral’s development properties. I don’t know. TSN’s Engraved on a Nation remains the most ambitious thing announced for Bell Media’s 2012-13 production slate, and that was revealed earlier in May. This year’s upfronts have been, as a whole, underwhelming. Maybe a whole whack of shows will be ordered by the end of 2012. In a year where the Canadian television world threatens contraction, I doubt it. I just watched the littlest hobo for the first time recently. Its naivete made it really fun to watch. I’d definitely watch if they made a remake that was just as simplistic and cheaply produced as the first one appears to be. The show’s utter lack of sophistication was its charm. Along with all that really really bad ’80s hair. Any remakes should be set in that same time period.